James Stumbo (left) and Kevin Norton, both of Iowa, entered the courtroom to attend their arraignment in Boston on Monday. 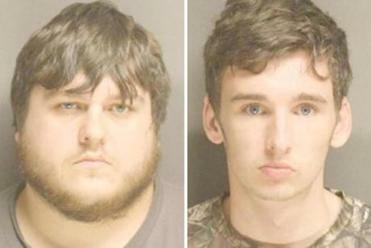 They made sinister threats in an Internet chat room, shared a photograph of firearms on social media, and drove 25 hours from central Iowa to the Pokémon World Championship at the Hynes Veterans Memorial Convention Center with weapons and hundreds of rounds of ammunition in their car’s trunk, authorities said. Police said they worked on the case with Boston’s Joint Terrorism Task Force, a partnership that includes federal agents. Pokemon players rely on sportsmanship, leading to confusion about the arrest of two competitors. On a public Facebook page called “Mayhem Pokemon Crew,” Stumbo, 27, allegedly posted a photo of a white sedan with two long guns crossed over the trunk. “Kevin Norton and I are ready for worlds Boston here we come!! !” he wrote. 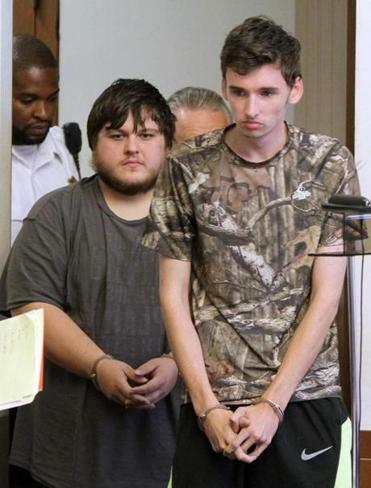 Police say they found an AR-15 rifle, 12-gauge Remington shotgun, ammunition, and a hunting knife in the 2002 Chevrolet Prizm the two men had driven to Boston. Boston Municipal Court Judge Lisa A. Grant on Monday ordered Norton and Stumbo held without bail. She set a dangerousness hearing for Sept. 1. The men stood expressionless at their arraignment as authorities laid out the charges against them. Both men were registered for the Pokémon tournament, police said. Stumbo appears to have won state tournaments this year in Nebraska and Minnesota, according to online results. The game is an international sensation, pitting players against each other using Pokémon trading cards. James Stumbo (left) and Kevin Norton. The two men had allegedly threatened specific individuals and discussed mass shootings in online chat rooms. Authorities have not said what they believe motivated the men. In court Monday, defense lawyers for the men said neither has a criminal record and both are employed. “Inside, there were a lot of kids, a lot of gamers, and thank God we were able to cut off whatever these two individuals coming from Iowa were up to,” Police Commissioner William B. Evans said. The men are charged with unlawful possession of a firearm, unlawful possession of ammunition, and unlawful possession of a large capacity rifle, Suffolk District Attorney Daniel F. Conley said in a statement. They currently do not face charges for making threats, but the investigation is ongoing, Conley said. News of the charges stunned passionate Pokémon players. Jacob Van Wagner, the world champion in the Pokémon Trading Card Game’s masters division, said he was surprised anyone from the Pokémon community could consider mass violence. Justin Lo, 23, knew the accused men from Iowa’s competitive Pokémon circuit. 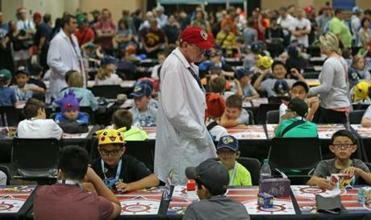 Lo traveled with them across the Midwest to compete in Pokémon tournaments over the past four years, he said. “I would never think of these two as plotters of any kind of violence,” Lo said in a Globe interview. “They were good to everybody who came up to talk to them. They were very smart, very good Pokémon players.” He remembered them as goofy, funny friends who loved the Pokémon community, he said. Neither ever mentioned guns and violence in Lo’s presence. But Lo, an Iowa State University student, said he noticed a change over the past two years. Stumbo and Norton became much closer, and Norton’s online persona dramatically shifted. Back when Lo and Norton became Facebook friends, Norton’s Facebook picture was of himself, smiling into the camera. Today, it’s a picture of Norton aiming a handgun, Lo said. Fitzgerald, who commands the Boston Police Department’s Bureau of Intelligence and Analysis, said at a Monday news conference that a moderator in a private online forum about Pokémon noted the threatening postings. Officials with Pokémon International, which oversees the trading card and game brand, notified the Hynes Convention Center, and officials there told police. Hynes security officials stopped Stumbo from entering the convention center Thursday evening and notified police, according to police reports. While officers were escorting Stumbo from the building, they found Norton as he arrived. Norton told officers he had a shotgun and Stumbo’s rifle in his car, which was parked in a public garage, the report says. Neither man could produce a firearm license, according to authorities. Police executed a search warrant on the car and found the weapons Friday, and the next day arrested Norton and Stumbo at the Red Roof Inn in Saugus, police said. Evans said police let the men go back to their hotel Thursday feeling confident that the public was in no danger. Police declined to say if they had kept the men under surveillance in the meantime. Norton and Stumbo were banned from the Pokémon event following the alleged threats, officials said. Under Iowa law, it would be legal for residents to obtain an AR-15 rifle or a 12-gauge shotgun, assuming neither gun was modified or “sawed off,” said Ross Loder, a bureau chief for the Iowa Department of Public Safety. Iowa does require a permit to acquire pistols and handguns, he said. Andy Rosen of the Globe staff, and Globe correspondents Virgie Hoban and Jacqueline Tempera contributed to this report. Mark Arsenault can be reached at mark.arsenault@globe.com. Follow him on Twitter @BostonGlobeMark. Astead W. Herndon can be reached at astead.herndon@globe.com. Follow him on Twitter @AsteadWH.